It's much harder than it looks; keeping the back straight, the hands poised in a gesture and the feet tapping a frantic rhythm, and all the time you are supposed to have a somewhat serene and expressive look on your face. Flamenco requires so much coordination, but when you get it right for just a moment, it feels like you've been transported into a dream world -the world of gypsies and Don Quixote, of rolling 'rrrrrrs' and fingers bouncing along guitar strings, as ladies with flowers in their hair, clap their hands and stamp their feet, and garlic wavers through the salty air. While we can't all quit our job and move to Andalucía, you can immerse yourself in Spanish culture at Casa de Flamenco in Adelaide. Firstly, you can learn Spanish guitar or Flamenco Dance. Casa de Flamenco has both children's and adults classes. 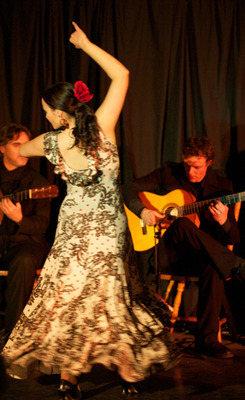 as well as beginners to advanced classes, in Flamenco dance and guitar. They also offer performance opportunities to motivate the students. Flamenco is a culture of performance and storytelling. It uses gestures and rhythm. Each dance class consists of a warm up, technique exercises and choreography- so it's a really fun work out as well. Casa de Flamenco also offers 4 levels of Spanish taught by qualified native teachers. So, why not pair up the language with the dance or guitar. For more information go to the Casa de Flamenco website. Why? Learn latin culture and music.